In wake of the trough of low which was over Southwest Bay of Bengal off Tamil Nadu Coast, the state of Tamil Nadu received light to moderate rainfall activity during the last 24 hours. 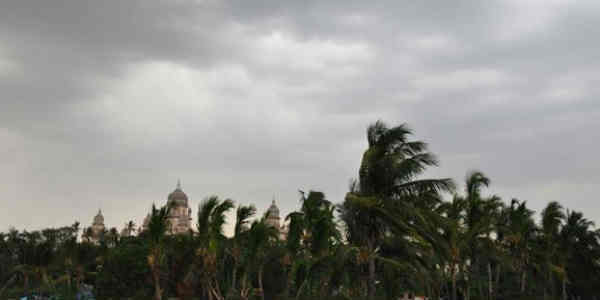 However, the capital city Chennai observed mainly dry weather with cloudy sky conditions. In the last 24 hours from 08:30 am on Sunday, Puducherry recorded 32.8 mm of rain, followed by Cuddalore 13.3 mm, Adiramapatnam 10.1 mm, Nagapattinam 7.4 mm, Madurai 7.3 mm, Coonoor 6.5 mm, Coimbatore 6.2 mm, Kodaikanal 4.4 mm, Thondi 4.2 mm, Palayamkottai 4 mm, Ooty 1.2 mm and Karaikal 1 mm. At present, the trough of low lies over Comorin-Maldives region and adjoining equatorial Indian Ocean, extending up to 1.5 km. Therefore, during the next 24 to 36 hours, we expect light to moderate rain or thundershower activities to occur over isolated places of Tamil Nadu and Puducherry. Further, from December 26 onward, weather is expected to start clearing up and on December 27, in the absence of any significant weather system, we expect almost dry weather conditions to prevail over the entire state of Tamil Nadu along with Puducherry region. Talking about the capital city, Chennai, during the next 24 hours, sky conditions are likely to be generally cloudy. Maximum and minimum temperatures are likely to be around 30˚C and 23˚C respectively.